Nearly four months ago I stood at the front of a crowded classroom at Columbia University and began teaching the third year of my undergraduate virology course. Twice a week we discussed the basic principles of virology, including how virions are built, how they replicate, and how they cause disease. Yesterday was the 26th and last lecture in the course, entitled “H5N1”. In this lecture we covered the recent controversy over the publication of results on adapting avian influenza H5N1 viruses to transmit by the airborne route among ferrets. Fittingly, one of the two papers in question will be published tomorrow. Each lecture in my virology course has been recorded as a videocast and is available at the course website, at iTunes University, or on Vimeo. 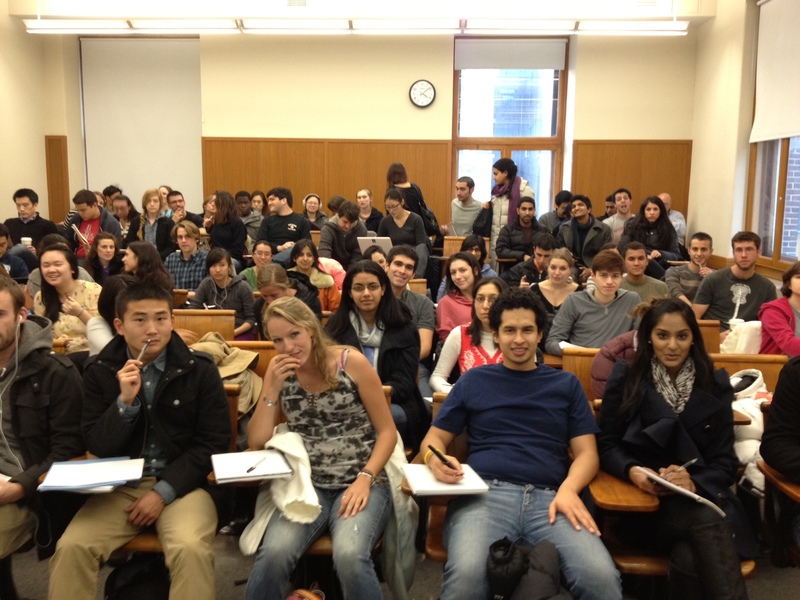 Eighty-seven Columbia University undergraduates registered for the course in 2012, but over 14,000 individuals have subscribed to virology W3310 through iTunes University. I believe that it is important that the general public understand as much as possible about viruses, so they can participate in the debate about issues that impact them, such as XMRV or H5N1. It is my goal to be Earth’s virology professor. I wish that every professor I had had such passion and energy and a TWiV-like blog/show so I could be updated on all the big science gossip/news to complement my in-class knowledge! I can’t recount how many times I told my non-science friends about TWiV as an exhibit to prove that science is cool and important. Thank you for being passionate scientists that made me want to study science (and be super nerdy but connected to the world) in the first place. I would like to thank all the students of virology in and out of the classroom for their enthusiasm and their willingness to learn a complex subject. Virology will be offered again in the spring of 2013, and you can be reassured that it will be different. My course, like viruses, is continually evolving. See, I told you you were savvy! “Earth’s Virology Professor” sounds like a great tshirt! Such a t-shirt is a good idea. With an image of Earth covered in virions? Like the TWiM logo? As a graduating senior in your course about to enter the world of academic science, I’ve often felt frustrated by how insulated the ivory tower can be. Moreover, I’m amazed by how happy some of its inhabitants are for it to stay that way. This website was the first direct illustration to me that it takes a great deal more courage to place oneself in the public’s line of fire than to remain in the comfort zone of talking science solely with one’s colleagues. I dove into TWiV only two weeks ago and am intrigued to see virology intersect so directly with policy and public health. I look forward to keeping up with these podcasts during grad school. Thank you for such an illuminating and inspiring use of social media. I love your blog, TWiM, TWiV, and your course from iTunes U. It is greatly appreciated! Favorite class this spring. Thanks for an intriguing semester Professor Racaniello! I’m following your course from Rome Italy so, from distance of thousands Km, many many thanks to the Earth’s virology professor! Or rather, a viral particle where the glycoproteins form the countries and the oceans are open space, showing the DNA/RNA particles within. That’s a shirt I’d buy. Anyways, following TWIV from Brazil and trying to find time for your course.